An organic food supplement to infuse, strawberry mint flavor, for the beauty of the body and a slim silhouette. 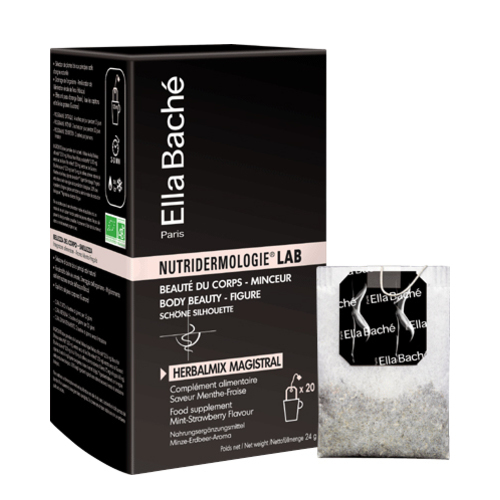 Food supplement created by the Ella Baché Laboratory and Doctor Arnéodo ‘s French Pharmaceutical Laboratory. • ALGINATE OF SODIUM (COATING AGENT). * INGREDIENTS OBTAINED IN ACCORDANCE WITH THE RULES OF ORGANIC PRODUCTION. 100% OF INGREDIENTS OF AGRICULTURAL ORIGIN ARE OBTAINED ACCORDING TO THE METHOD OF BIOLOGICAL PRODUCTION.